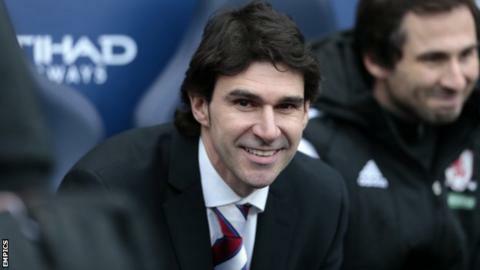 Head coach Aitor Karanka says Middlesbrough's focus remains fixed on a Championship promotion bid, despite FA Cup success at Manchester City. Boro booked a fifth-round place with a 2-0 victory at the Premier League champions last weekend and were paired with cup holders Arsenal in the draw. Saturday's league return pits Boro against promotion rivals Brentford. "From Tuesday on the training pitch they were already thinking about Brentford," Karanka told BBC Tees. "I didn't hear anyone talking about the Arsenal or Manchester City games, all of them were training and thinking about this weekend. "It was a surprise and a very good thing." The third-placed Teessiders are on a run of seven games unbeaten going into the trip to Griffin Park, and were 4-0 victors against the fifth-placed Bees in September's corresponding fixture. Karanka believes the City win and recent form has galvanised the squad and given them extra belief for the season ahead. "I think they grow every game, they know their potential," he added. "When we drew against Liverpool, we know it wasn't a coincidence because we beat Manchester City. "Now they all think we can beat everyone, not just the players who are playing, the whole team believes."